(22055.1279, Ray Jacoby Collection, OHS). With the philosophy of "have what people want at a price they can afford to pay," the T.G.&Y. corporation opened its first variety store in Norman, Oklahoma, in 1936 and expanded to 930 outlets nationwide by the 1980s. The company was organized by Rawdon E. Tomlinson (ca. 1883–1948) of Frederick, Enoch L. "Les" Gosselin (1901–77) of Cordell, and Raymond A. Young (1904–2002) of Kingfisher. When they met at a trade show in Oklahoma City in 1932, they individually operated variety stores throughout the state. In 1935 the three men pooled their resources and formed a firm known as Central Merchandise Corporation to build a warehouse in Oklahoma City. The storage facility allowed them to purchase bulk quantities directly from manufacturers rather than from wholesalers such as Butler Brothers. When Tomlinson, Gosselin, and Young opened their first jointly owned outlet in 1936, the company's name came from the initials of their last names, placed in order of their age, with Tomlinson being the oldest. On February 1, 1946, the business incorporated under Delaware laws as T.G.&Y. Stores Company. Generally, the outlets first opened in rural communities and small towns and gradually made their way to urban centers and suburbs where malls developed during the 1960s. 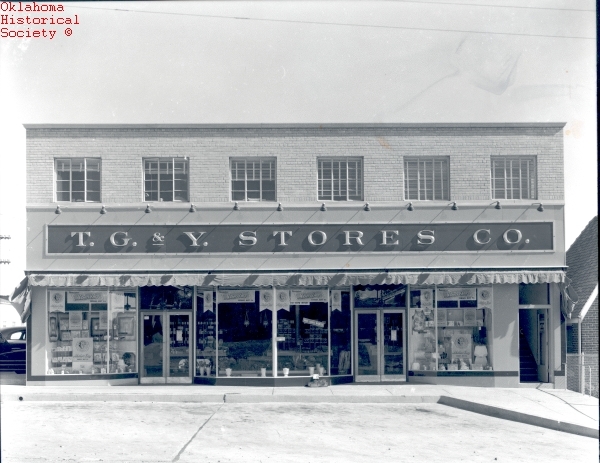 Most stores were six to eight thousand square feet; however, T.G.&Y. Family Centers built in the 1960s usually had an average of forty thousand square feet. During World War II, due to wartime manufacturing, the company had trouble obtaining fixtures to outfit their new stores. To solve the problem the owners eventually built their own fixture factory in Oklahoma City in 1956. In 1957 Butler Brothers of Chicago, Illinois, bought out T.G.&Y., which had 127 outlets at that time. However, the company remained autonomous, and the management did not change. By 1960 T.G.&Y. was a subsidiary of Chicago-based City Products, which operated other variety stores nationwide. Six years later Household Finance Corporation (HFC) purchased City Products. In order to be more competitive, in the 1980s T.G.&Y. executives changed some of the outlets to be comparable to department stores. However, the company continued to have financial difficulties. In January 1986 McCrory Corporation of York, Pennsylvania, bought the 730 T.G.&Y. outlets from HFC. The buyout brought about the closure of some Oklahoma stores and warehouses. In 2002 McCrory went out of business, causing the final demise of former T.G.&Y. stores. Ironically, Raymond Young, the last survivor of the three cofounders, died the same year. Daily Oklahoman (Oklahoma City), 26 September 1957, 12 June 1966, and 22 April 1983. Odie B. Faulk, The Making of a Merchant: R. A. Young and T. G. & Y. Stores (Oklahoma City: Oklahoma Heritage Foundation, 1980). "T.G.&Y., From Regional Chain to National Power," Chain Store Age (December 1966). Linda D. Wilson, "T.G.&Y. Stores," The Encyclopedia of Oklahoma History and Culture, https://www.okhistory.org/publications/enc/entry.php?entry=TG001.